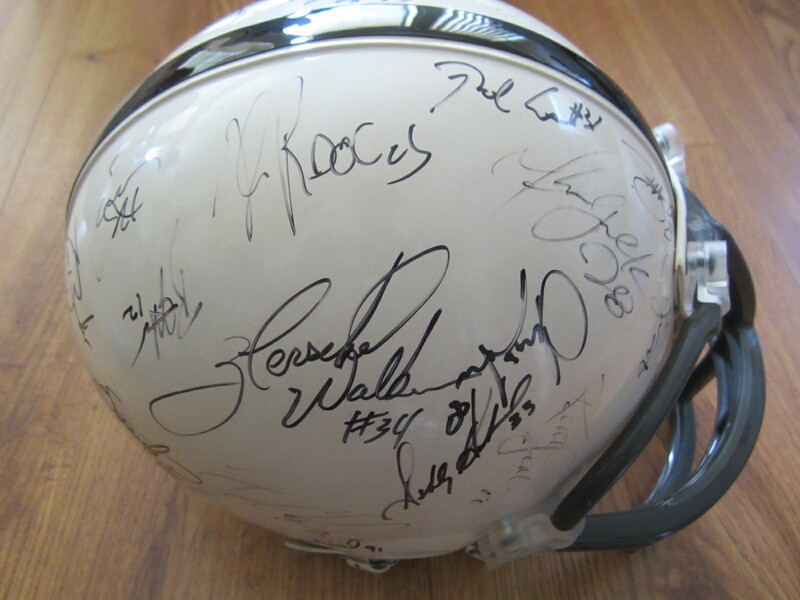 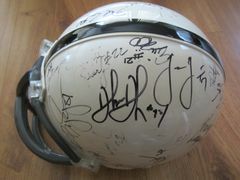 Riddell full size game model helmet, white with black center stripe and old style gray plastic facemask, autographed in black marker by 38 players from the 1999 NFL Players Super Shoot-Out golf tournament in Tampa including many current/future Hall of Famers, Heisman Trophy winners and Pro Bowlers: Herschel Walker, Tiki Barber, Eddie Kennison, Keenan McCardell, Marshall Faulk, Charlie Batch, Greg Lloyd, Bobby Engram, Ty Detmer, Mark Royals, Thurman Thomas, Desmond Howard, Koy Detmer, Jason Garrett, Jeff Blake, Leslie O'Neal, Andre Reed, Jason Sehorn (signed twice), Billy Joe Hobert, Eric Bieniemy, Tim Brown, Ronde Barber, Ashley Ambrose, Phillippi Sparks, Brian Mitchell, Ki-Jana Carter, Pat Terrell, Chester McGlockton, Kent Graham, Reidel Anthony, Kendall Gammon, Tom Carter and Irving Fryar (5 signatures are unidentified). Obtained in person at the event, with certificate of authenticity from AutographsForSale.com and original event program. 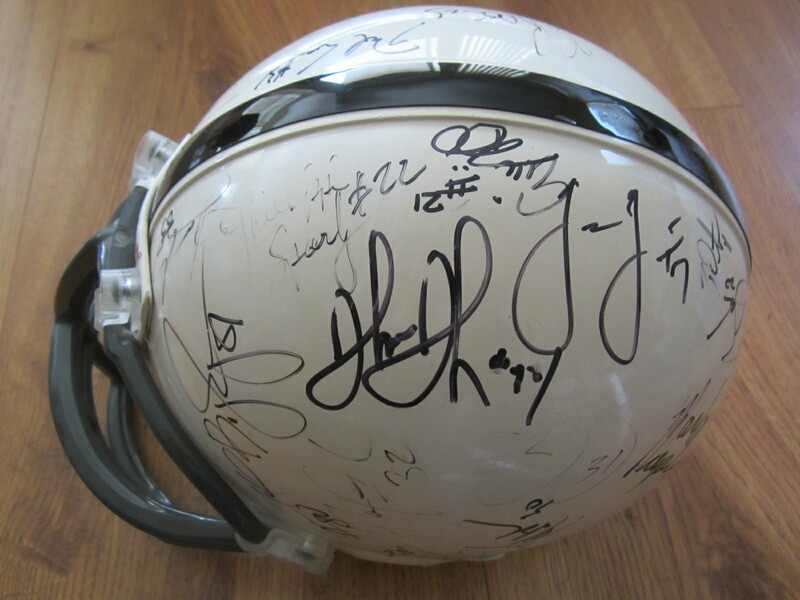 HELMET HAS MINOR TO MODERATE AGE FADING PLUS MINOR DISCOLORATION AND HANDLING FLAWS.